This week I have been working with the new amazon Echo second generation oalso known as "The Dot." I first saw the amazon Echo in use last year at the California Council of the Blind convention in Forest Hills, Los Angeles. A team of amazon tech experts were putting the Echo and the voice activated and resposne system known as Alexa through her paces. I was very impressed with the product, but was put off by the high price tag, at that time the Echo was in the region of $200, it has since come down in price but is still over $100. To read about amazon Echo first generation click here. A few months ago amazon announced the release of the second generation Echo Dot. This device would be smaller since it doesn't contain a lower frequency speaker which fills most of the first generations case. 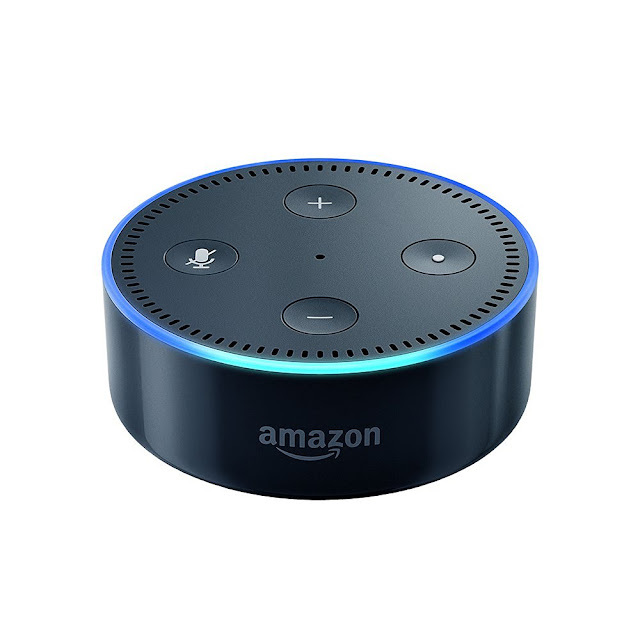 To compensate you can link the Echo Dot to an existing sound system or use bluetooth to link to Bluetooth speakers or use Bluetooth Headphones. Since the new amazon Echo Dot costs less than $50 I decided to try it out. When my Dot arrived I was surprised how small it is. The Dot is about the same diameter as a can of soup and a little over one inch high. It comes complete with a power cord in the box. Set up was straight forward. Plug the power chord into the Dot and the other end into a power socket. The Dot lights up blue then orange or powering up. You then need to upload an app to your smart phone. I had some trouble as the app store on my iPhone 6 said that the app was compatable only with Android devices, so I went to amazon.com and uploaded the iPhone version of the app from there. Once you link your Dot to your phone via the app, you can then add your wi-fi settings to the Dot. Enter your wi-fi details by selecting from a drop down menu which appears on your phone and then enter your wi-fi security password on the app. Alexa will powerdown and restrt. You can then begin asking Alexa; amazon's equivalent of Siri, any questions you like. The Dott does have it's own built in speaker which for me is very good at doing it's job. I like to listen to the radio as I work so that is my main purpose for buying the Dot. The Dot will stream most services like, spotify, I heart Radio and NPR in the United States. I love to listen to the BBC Radio stations during the day and the Dot has streamed both spoken and music stations very well, even when my internet radio has sometimes dropped a signal, the Dot is still there. 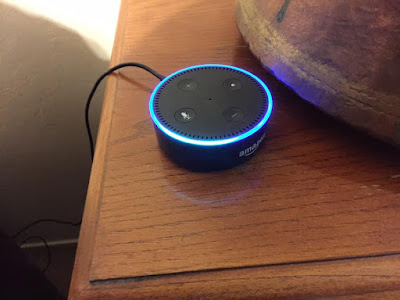 You can also use the Dot to listen to books such as those available on Audible and since the Dot is linked to your amazon account you can also listen to any Kindle books in your library as long as they have " Text to Speech" enabled, which most books do these days. You can program your Dot to find stock prices, create personalized news reports, check the weather, prepare shopping lists and also turn on a thermostat or turn lights on and off, even at a long distance using the app on your phone. Is the amazon Echo Dot Worth the money? For me the answer to this question is a very definite yes. It fulfils a need for me as it stands. For less than $50 I have a great sounding internet radio. I can talk to Alexa and find out news sttories that are important to me. I can read my kindle and audible books easily at the command of my voice. No more trying to find a book on a book list croded screen. It can add other bits of hardware to my home to allow me to control lights and heating or cooling. I can do a lot more this week than I could last. That means a big thumbs up for the best $50 I have spent this year.